We will be happy to provide you with additional information and arrange for phone, Facetime or Skype calls.If you would like to stay in contact please join out mailing list. Please find below how to reach us. Fly to Ancona Falconara airport (80km away) from Rome (Alitalia), Munich (Lufthansa) or London Stansted (Ryan Air) and drive south on the A14 Autostrada Adriatica to Porto San Giorgio. 3.3 hours highway drive heading east through l’Aquila and Teramo to the Adriatic coast on the A24 highway and then north on the A14 to Porto San Giorgio. You need a car for your stay at Monterosato Country House; closest car rentals are in Civitanova Marche (25 km), Ancona railway station (68 km) and Ancona Falconara airport (80 km). Once you exited the A14 Autostrada Adriatica highway at Porto San Giorgio - Fermo you are 15 minutes away from Monterosato Country House that is located in Contrada Lavandara 7, Fermo: it is a 11.5km drive in the countryside; the last 2km are unpaved road. Be aware that, unfortunately, there is another "Contrada Lavandara" in the town of Fermo that is not us. This wrong location may show up in you navigator or Google Maps. 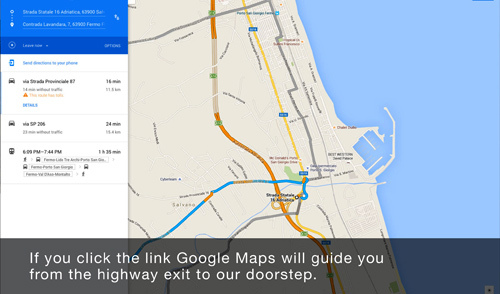 If you click the link below Google Maps will guide you from the highway exit to our door step.